What is the value of an individual sports card? What is the difference between book value and market value? Who determines what it's worth? Today we have sports card price guides that assist us with determining the value of a card. Cards are priced individually and are priced according to near mint condition, which means an 8 out of 10. Price guides then determine that cards that are better than near mint are valued at a higher price. This is what I consider "BOOK VALUE". "MARKET VALUE" is the price that a card has sold for recently. The best way to check what the market value on a card is to check recent sales from auction sites. The latest price is a good indicator what a card is worth. Remember also that auction sites charge shipping fees and sometimes other fees so this may effect the actual market value. If I purchase an individual card from an auction site for $1.50 and I pay $3.50 to have it delivered, I would determine market value at $5.00. So, who really determines what a card is worth? The answer is....THE LAST BUYER!! Does a price guide provide the collector with the actual value of an individual sports card? The answer is NO, they provide a nice reference with easy to find "BOOK VALUES". Sometimes an individual is willing to pay more than double book value for a specific card and other times an individual may only be willing to pay 30% of book value. Here is an example of book value versus market value and the changes that effect the value of a card. 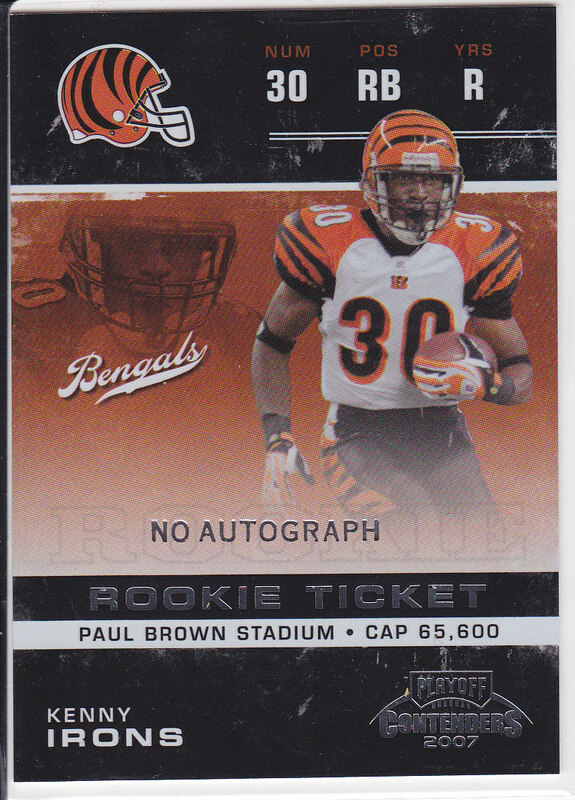 In 2007, Playoff Contenders released the short print list of rookie ticket autographs and card #179 was a redemption for an autograph card of Kenny Irons that would be printed to only 50 copies. The book value was $500, but an individual paid $690.00 from an auction site. The player was injured and never played for the team that drafted him resulting in the cards book value decreasing to $200.00. Now because of the redemption an expiration of the redemption did all 50 cards hit the market? Are there less than 50 out there? Does this increase or decrease the value of this individual card? Are you confused now? I personally would be willing to pay over book value if this was the only card that I needed to complete my set of 140 rookie ticket autographs. I would not be willing to pay more than $100 just to own a short print card of a player that did not play in an NFL game. "MARKET VALUE" is "NOW" and the collector determines the value of an individual sports card, not a price guide.